Sustainable Coffee Bay with a Spring in our Steps newsletter! Spring into Summer with our Sustainable Coffee Bay newsletter edition! This quarter, we’d love to show you our work not only at Ikhaya Labantwana Montessori, but also our other projects. 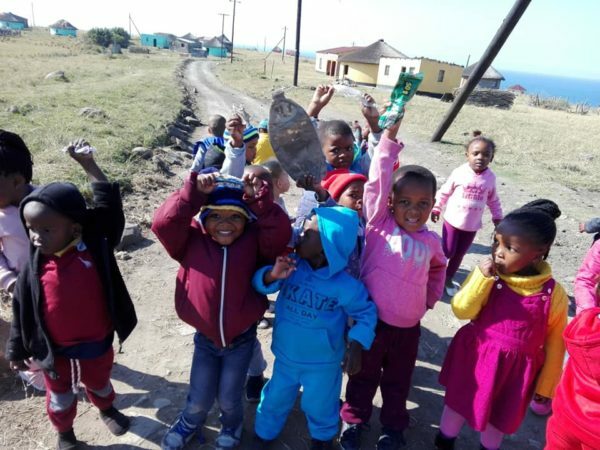 Read on to find out more including what the children at Ikhaya Labantwana in Coffee Bay have been up to this term, some unusual facts about Nelson Mandela, our first steps into inclusive education and how you can be #morethanavisitor with our Wish List! As we celebrated what would have been Nelson Mandela’s 100th birthday on 18th July this year, here are some lesser known facts about the legend of South Africa. His original name was Rolihlahla Mandela. One of his teachers named him “Nelson” out of a common practice of giving African students English names. 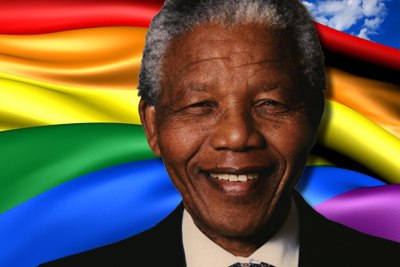 As a sign of respect, many South Africans referred to Nelson Mandela as Madiba, his Xhosa clan name. “Rolihlahla” literally means ‘pulling the branch of a tree’. Mandela wasn’t removed from the U.S. terror watch list until 2008, at the ripe old age of 89. There are hundreds of streets across the world named after him including in Wales, India, Brazil and Mauritius. Mandela has also had a woodpecker (Australopicus nelsonmandelai), a nuclear particle (Mandela particle) and and orchid (Paravanda Nelson Mandela) named after him! Our Education and Youth projects continue to do well. With a 98% employment rate, we continue to collaborate with the South African College for Tourism (SACT) and The Tracker Academy, placing adult students from our area onto their one year training courses. We currently have two ladies coming up to the end of their course this year. Last year’s two graduates are both in work. If you are heading to lovely Coffee Bay, say hi to Yonela! She came 3rd in her class and is working at Coffee Shack since graduating from SACT in 2017. Our St. John’s College students this year, with their parents at our most recent holiday meeting. Our other partnership with St. John’s College, offering a sound academic finish to high school, is also going well this year. We had four girls start in Grade 10 (14-15 years old), and we have one student in Grade 11. Not only do we consider their academic needs, but also other emotional and practical issues. We are looking at supporting our students to gain their Learners and Driving License once they are in Grade 11. If you also drive, do you remember that liberating freedom of driving off on your own? We want to be able to offer that opportunity to all our students! We have some great plans in the pipeline, particularly with our Early Childhood Development projects. Ikhaya Labantwana has already introduced a reading program and are loaning books out to the children to take home with them. The pre-school will also be offering our veranda area to the local community caregivers in the afternoons for Reading Clubs. 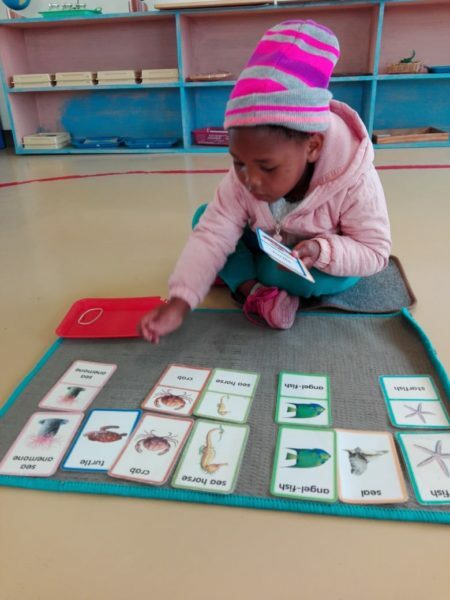 The importance of reading and being read to as a child cannot be underestimated; the literacy rates in South Africa make for grim reading and it is up to all of us to play our part for the future of both our children and country! 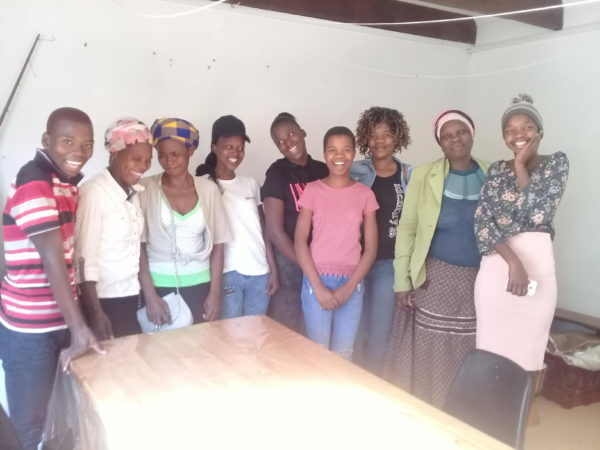 Although we bid farewell to Ziyanda who left us in May, we offer a big warm welcome to Sanelize (Projects Assistant) and Tommy (Administration). Both have joined the Sustainable Coffee Bay team part time. Sanelize is an intern combining her time at Coffee Shack and Sustainable Coffee Bay. On top of this, she is also studying with UNISA to finish her Diploma in Nature Conservation. Sanelize will be helping us coordinate some of our existing projects including high school scholarships and ex-mine workers support. She will also receive training to deliver on some of the new projects we want to start in ECD. Tommy is our office guru, usually found buried in spreadsheets and a great asset to the efficient running of our main office. Sanelize (left) with the Wellness Wagon team. It was a very busy term once more with a lot of things happening. 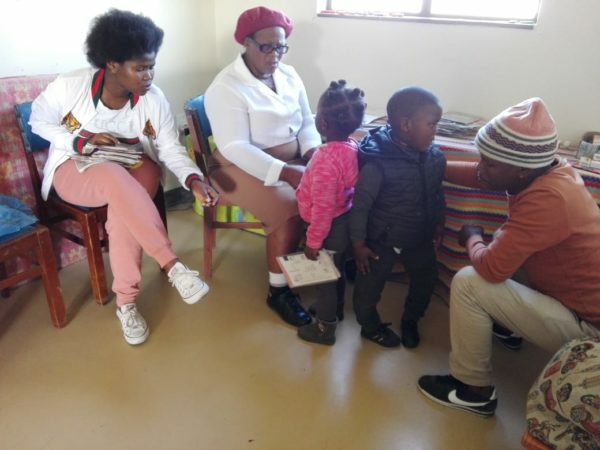 The Wellness Wagon (school mobile health clinic) came to do their regular check-up for all the children and referred some to the clinic who needed it. We have noticed that health outbreaks and attendance have respectively reduced and improved since implementing a once a term health check. We had two visitors this term –Elodie from Marseilles in France and Laura and Steve from Italy and the UK respectively. It was so good to get to know them personally and have other experienced Montessorians in our environment. We’re looking forward to working with our champion supporters; we even have some new videos in the making thanks to our overseas guests. Watch this space for the new releases! The team from Ikhaya Labantwana with Laura and Steve. The team again, this time with Elodie. 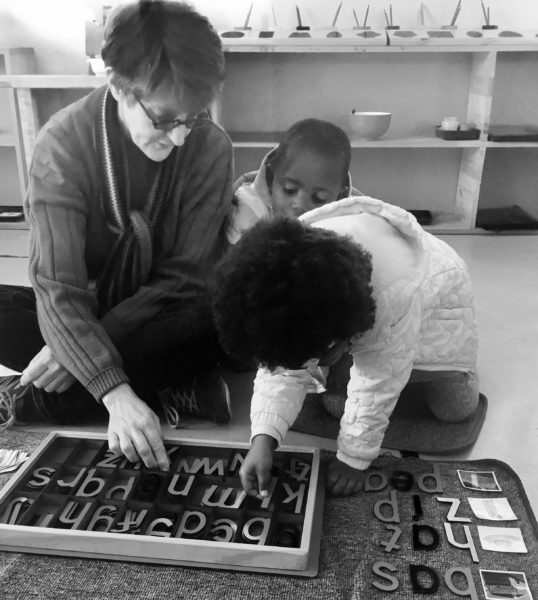 One of our teachers, Nomonde Majongozi, attended the ESF (Teachers without Borders) Conference in Stellenbosch for two weeks where she was fortunate to meet other Montessorians from 28 countries. How good it was for her to interact and share her knowledge with people from all over the world. 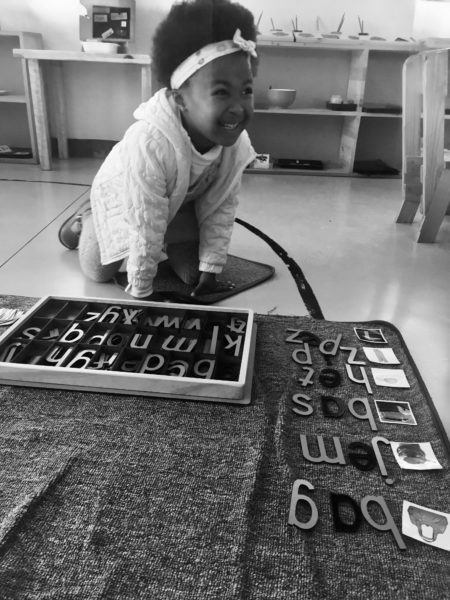 We might be from different countries and cultures, but we share something unique; the Montessori method of teaching. Our parent workshop was successful with the topic being “managing our children”, how to apply positive discipline and how that fits with our Montessori philosophy. We looked at causes of misbehaviour and how we can solve it in a positive way. We talked a lot about how we must always look at ourselves and the environment when a child acts strangely and ask ourselves what we can do to make it better. Should there be something changed in the environment or in myself? We as adults must be a positive example to our children, and whatever we expect from a child we must lead by example. 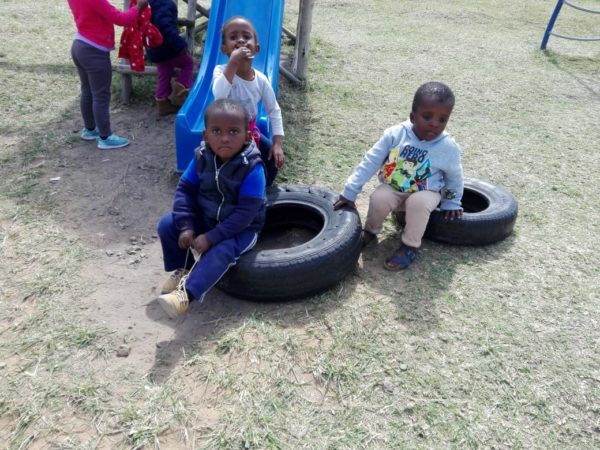 Isakhanya and Siphenkosi on the tyres at Ikhaya Labantwana Montessori. We have a new learner Siphenkosi Nombanjana who joined us in July and is deaf/mute. One of the other learners, Isakhanya befriended Siphenkosi and has become his “ears and mouth”. Wherever Isakhanya goes or whatever he does, Siphenkosi follows. At first Siphenkosi didn’t want to do anything at school and was slightly overwhelmed with all the children and equipment at our school, but when Isakhanya befriended him, he started doing activities. Whenever we speak to Siphenkosi, Isakhanya comments, “He doesn’t speak”. This is such a special friendship that these two boys will remember until they are old men. It is hugely touching when we see the two of them coming into the school yard in the morning hand in hand and reminds us time and again how fortunate we are to be able to hear and speak. 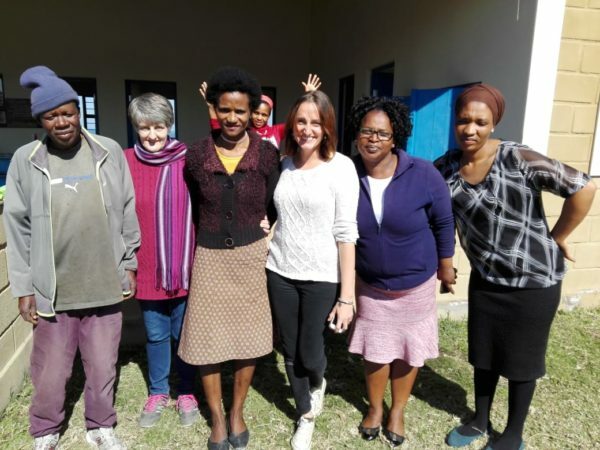 We are supporting the family in accessing all the services they need for Siphenkosi, and both learners and teachers alike are embracing inclusive education. 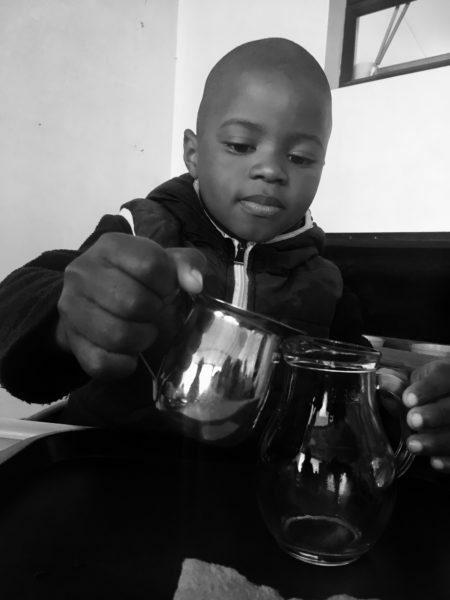 We are starting to learn what we can all do to support him effectively as we see Siphenkosi begin to thrive at school. Our theme for the term – where in the world? We continued to learn about the physical world we live in and this term started learning about the different oceans; starting with the Indian Ocean here in Coffee Bay. The children also learnt about the different sea animals such as the blue whale that is found in the Arctic Ocean. The children coloured in pictures of whales and learnt the names of different sea animals by using objects and matching cards. The children also watched a short video on Antartica enjoying the penguins and seals and fascinated to see icebergs breaking off. A great experience as our sub-tropical climate here means that none of the children have ever seen snow/ice like that before. We also learnt about Australia’s animals – in particular koala bears and kangaroos who carry their young in a pouch. Music holding the children’s attention. We celebrated South Africa’s Heritage day on 21st September when the children came to school dressed in their traditional clothes. We visited a neighbour’s house where the lady demonstrated how to make her own mealie meal (maize meal) by using two flat stones. The mealies (corn) is usually grown from September and harvested in May. We also visited another neighbour’s house to look at a traditionally built kraal on the property. 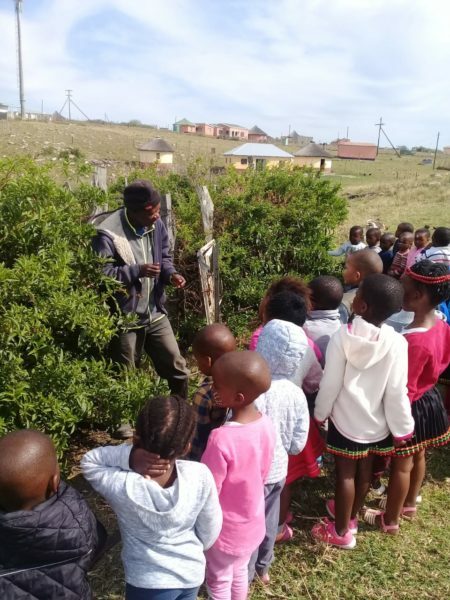 Our gardener Music became the teacher for a short time, explaining to the children more about kraals. It is used in much the same way as a barn and designed to keep their animals in. Smaller branches are used to make “poles” and the bigger branches of trees are weaved in between the poles to make the “wall”. Poverty often forces the local community to use what is available as building materials cost money. Nevertheless this is a locally effective method of keeping animals safe overnight and has the added bonus of being environmentally friendly. After we returned to the school, one of the respected Elders of the village came to the school to inspire the children with some traditional storytelling. Verbal story telling is very much part of the fabric that makes up Xhosa traditions with stories told and handed down the generations. Our Elder visitor told the story exactly as he had been told it by his parents. How long have you been working in a Montessori environment? I have been working in a Montessori school since 2001. How did you first hear about Ikhaya Labantwana? A few years ago I was searching on the internet and came across Ikhaya Labantwana. 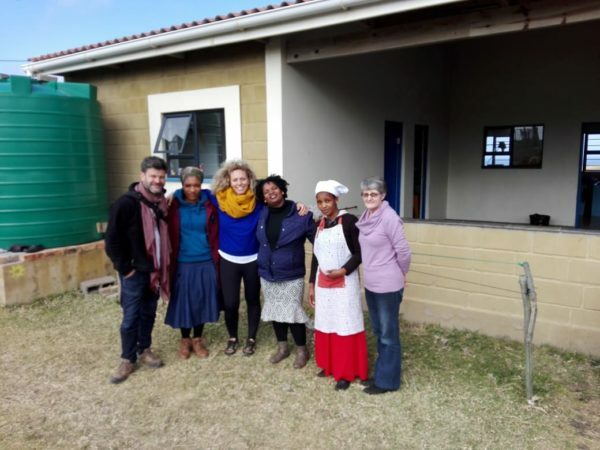 I was very impressed that there was a Montessori school on the Wild Coast in the former Transkei. 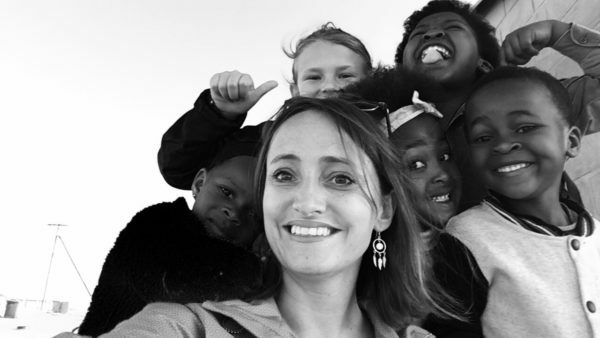 During 2015, a colleague of mine saw an advertisement for the role of Principal and shared it with me, knowing I would be interested and wanted to get back in-depth to my Montessori teaching roots. I was looking out for a new job at the time and so applied for the position and here I am! How long have you been at Ikhaya Labantwana Montessori? I have been working at Ikhaya Labantwana since January 2016. Did you find it difficult to adapt to the rural lifestyle here? I grew up in a rural environment (farm like) so it wasn’t that difficult to adapt. I also speak and understand Xhosa which makes a huge difference here. There is still a lot about the Xhosa culture which I don’t know about, so I enjoy learning something new all the time. I enjoy seeing how the children develop emotionally, socially and academically during the 3 years that they are with us at Ikhaya Labantwana. It is also rewarding to see that children get quality education in a rural area, giving them the best start in life for opportunities to go out and find or create a job for themselves in the future. What would you like to see happening in Coffee Bay? I would like to see an improvement in the local junior schools here in order for us to build successfully on what we are doing at Ikhaya Labantwana. Be #morethanavisitor by supporting our work in Coffee Bay! We know we sound like a stuck record (remember those anyone??) but we really and true rely on our sponsors, donors and supporters to make our work happen. You will receive quarterly updates, have the opportunity to visit our pre-school, chat with our alumni in the local area, build relationships with high school students or let us know if you have skills we need but cannot find locally! On a more somber note, just 9% of eligible children here complete their Matric (Grade 12), with less than 1% going to university. There are so many barriers to accessing the most basic of services here such as healthcare and schooling. It can be difficult to imagine, but family’s often have to choose between things like buying food or buying shoes for school. There is not enough for both. Or maybe they need the money for transport to the clinic for their sick child? Or should that money go to the child who needs to get to school over 20km away? These are decisions no family should have to make! 18 sponsors for our pre-school children at Ikhaya Labantwana Montessori. 5 sponsors for our High School Scholarship program to St. John’s College in 2019. Desktop or Laptop computer, to replace our 2011 model that is on its last legs! Colour printer for making our own pre-school materials. 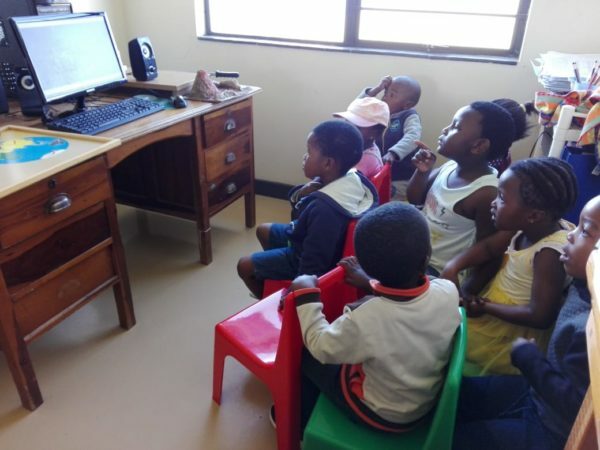 Children’s books and audiobooks for 0-3 years and 3-6 years in Xhosa and English. Huge thanks to Elodie for these gorgeous photos!